* Epoxy coatings will chalk and fade upon exposure to sunlight, elevated temperatures, or chemical exposure. Discoloration and normal chalking does not impact performance. Light colors will darken over time. Some batch-to-batch variation in color is to be expected. Color matches are approximate. Coating performance is, in general, proportional to the degree of surface preparation. 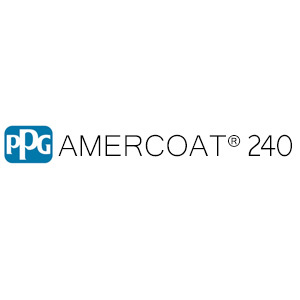 Abrasive blasting is usually the most effective and economical method.When this is impossible or impractical, Amercoat 240 can be applied over mechanically cleaned surfaces. All surfaces must be clean, dry and free of all contaminants, including salt deposits. Contact PPG for maximum allowable salt containment levels. Mild Steel – Remove all loose rust, dirt, grease or other contaminants by one of the following depending on the degree of cleanliness required: SSPC SP-2, 3, 6, 7 or 10 (ISO 8501-1 St-2, St-3, Sa 1, Sa 2.5). These minimum surface preparation standards apply to steel that has been previously abrasive blasted. The choice of surface preparation will depend on the system selected and end-use service conditions. For more severe service and immersion, clean to SSPC SP-10 (ISO8501-1 Sa 2.5). Blast to achieve an anchor profile of 2-4 mils (50-100microns) as indicted by a Keane-Tator Surface profile Comparator or Testex Tape. Previously blasted steel may be ultra-high pressure water jetted to SSPC SP WJ-2(L) / NACE WJ-2(L). The wet surface can be dried by blowing with dry compressed air giving special attention to horizontal surfaces and recesses. Concrete – Prepare / clean surface in accordance with SSPC SP-13 guidelines. Abrade surface per ASTM D-4259 to remove all efflorescence and laitance, to expose sub-surface voids, and to provide a surface roughness equivalent of 60 grit sandpaper or coarser. Test for moisture by conducting a plastic sheet test in accordance with ASTM D4263. Fill voids as necessary with Amercoat 114A epoxy filler. Galvanized Steel – Remove oil or soap film with detergent or emulsion cleaner. Lightly abrasive blast with a fine abrasive in accordance with SSPC SP-16 guidelines to achieve a profile of 1.5-3.0 mils. When light abrasive blasting is not possible, galvanizing can be treated with a suitable zinc phosphate conversion coating. Galvanizing that has at least 12 months of exterior weathering and has a rough surface with white rust present may be over-coated after power washing and cleaning to remove white rust and other contaminants. The surface must have a measurable profile. A test patch is recommended to confirm adhesion. Not recommended over chromate sealed galvanizing without blasting to thoroughly remove chromates. Adhesion problems may occur. Non-Ferrous Metals and Stainless Steel – Abrasive blast in accordance with SSPC SP-16 guidelines to achieve a uniform and dense 1.5-4.0 mil anchor profile. Size and hardness of abrasive should be adjusted as necessary based on the hardness of the substrate. Aluminum may be treated with a surface treatment compliant with Mil-DTL-5541 or equivalent (non-immersion applications only). Repair – Prepare damaged areas to original surface preparation specifications, feathering edges of intact coating. Thoroughly remove dust or abrasive residue before touch-up. Surface temperature – Must be at least 5°F above dew point temperature. Maximum 140°F unless a lower maximum is specified. General air quality – Area should be sheltered from airborne particulates and pollutants. Avoid combustion gases or other sources of carbon dioxide that may promote amine blush. Ensure good ventilation during application and curing. Provide shelter to prevent wind from affecting spray patterns. Refer to Information Bulletin #1489 for further information on prevention of amine blush. 3 hours 1.5 hours 40 min. Airless spray – 45:1 pump or larger, 0.019 – 0.023 fluid tip, 2400 – 3,000 psi. or vapor as well as contact between the wet paint and exposed skin or eyes. ** Dry times are dependent on air and surface temperatures as well as film thickness, ventilation, and relative humidity. Maximum recoating time is highly dependent upon actual surface temperatures – not simply air temperatures. Surface temperatures should be monitored, especially with sun-exposed or otherwise heated surfaces. Higher surface temperatures shorten the maximum recoat window. Surface must be clean and dry. Any contamination must be identified and removed. A detergent wash with Prep 88 or equivalent is required prior to application of topcoats after 30 days of exposure. However, particular attention must be paid to surfaces exposed to sunlight where chalking may be present. In those situations, a further degree of cleaning may be required. PPG Technical Service can advise on suitable cleaning methods. If maximum recoat/topcoat time is exceeded, then roughen surface. Type Approval by DNV and ABS to comply with IMO Resolution MSC.215(82) Performance Standard for Protective Coatings (PSOC) for seawater ballast tanks. PPG warrants (i) its title to the product, (ii) that the quality of the product conforms to PPG’s specifications for such product in effect at the time of manufacture and (iii) that the product shall be delivered free of the rightful claim of any third person for infringement of any U.S. patent covering the product. THESE ARE THE ONLY WARRANTIES THAT PPG MAKES AND ALL OTHER EXPRESS OR IMPLIED WARRANTIES, UNDER STATUTE OR ARISING OTHERWISE IN LAW, FROM A COURSE OF DEALING OR USAGE OF TRADE, INCLUDING WITHOUT LIMITATION, ANY OTHER WARRANTY OF FITNESS FOR A PARTICULAR PURPOSE OR USE, ARE DISCLAIMED BY PPG. ANY KIND, STRICT LIABILITY OR TORT) FOR ANY INDIRECT, SPECIAL, INCIDENTAL, OR CONSEQUENTIAL DAMAGES IN ANY WAY RELATED TO, ARISING FROM, OR RESULTING FROM ANY USE MADE OF THE PRODUCT. This sheet supersedes all previous versions and it is the Buyer’s responsibility to ensure that this information is current prior to using the product. Current sheets for all PPG Protective & Marine Coatings Products are maintained at www.ppgpmc.com. The English text of this sheet shall prevail over any translation thereof.